Duckweed can be quite problematic for pond owners as the aquatic plant lowers the oxygen levels of small ponds. The deprivation of oxygen kills fish, but can also cause problems with the good green algae found in non-moving waters. To restore your pond and prevent further issues, you need to look into homemade duckweed killer. This invasive plant lives in nutrient-rich ponds alongside another problem water plant called watermeal. These two plants will work together to cover the entire body of water when the perfect conditions are met. Whether you have these plants in your pond, control needs to start in early spring. Depending on the severity of the invasion, results can take several years to see. Do I Need to Remove Duckweed? As the smallest flowering plants, free-floating duckweed, also known as Lemna minor, ranges in size from 1/16 inch to ¼ inch. Aside from its small size one of the most identifying traits of duckweed is that it floats on the water’s surface and does not attach itself to the bottom of the pond. Having one to three leaves, duckweed has a very fine root hanging from the bottom of the plant to absorb nutrients. Not attached to anything, the plant is free to move about the water, whether it’s following currents or being blown along by the wind. This invasive plant thrives in slow-moving or motionless bodies of water. Growing the plant does require a lot of nutrients with nitrogen and phosphorus high on the list. Nutrient sources for these plants come from a variety of sources, including tree leaves, leaky septic tanks or systems, runoff from farming, fertilizer, and Canada Geese. Most of the time removing duckweed is a matter of personal choice. For ponds with fish or other water plants, such as water lilies, these fast-growing ground cover plants can cause numerous problems. Too much duckweed creates a spike in ammonia levels and reduces oxygen levels in the water. Duckweed depletes oxygen because as it grows some dies off and beneficial bacteria must work to break down the decomposing plants causing them to use more oxygen than usual. If too much duckweed is dying, biological filtration is affected and results in the spike of ammonia and nitrites. These problems will continue to occur until the decaying waste has been removed. How to get rid of duckweed naturally involves using biological controls, which includes introducing natural predators like grass carp, goldfish, and koi. Introducing these predators to your entire pond and the surrounding area will control an already established overgrowth of the floating plant. This method is more to prevent growth in larger ponds or to keep a smaller problem under control. If the duckweed problem is out of control, you might need to use chemical herbicides to get a handle on it. Use a large bucket to mix all three components. Pour the mixture into a pump sprayer. Do not spray the entire surface of the pond; only spray the plants with the aquatic herbicide. Too much reduces the oxygen in the water, which can harm your fish and other plants. If the problem persists, repeat application in two weeks. Always use aquatic herbicide as a spot treatment, spraying the plants directly. You can also mix chelated copper algaecide with the diluted aquatic herbicide for more effective results. The ratio would be 1 part copper to 2 parts herbicide. Along with algae, duckweed grows in fountains. Fountain algae control with vinegar has been proven successful on algae growth, but the results are mixed with duckweed. Vinegar can eliminate many aquatic weeds, and a fountain is a contained environment, so the vinegar will not harm other aquatic plants or life. Learning how to get rid of duckweed requires learning about prevention. The safest and most effective homemade duckweed killer is to control it naturally. Taking care of the duckweed before it has time to spread prevents the need for chemical treatments, such as the aquatic herbicide. One of the ways to prevent a duckweed infestation is through aeration. Aerating smaller ponds creates movement in otherwise still waters. The bubble aeration deprives the plant of needed nutrients; the lower nutrient levels, the less chance the plant has to survive. Epsom salt uses in the garden include improving nutrient absorption in plants with no increased nutrients to ponds through runoff. Leaf build up along the bottom of ponds encourages duckweed growth. Remove the dead leaves from pond water to prevent the black stinky ooze that feeds duckweed. Once you clean up the leaves from the bottom, you need to find a way to avoid new leaves from accumulating on the pond’s surface for an effective duckweed control. One way to get rid of these tiny plants is through manually removing them. When manually removing the duckweed it is best to do it on a windy day, as the wind will push the plant along the edges of the pond surface making it easier to take out. Use a pool skimmer net to scoop up the plants, or you can use a pool vacuum. Skim the water surface with the tool to scoop up the plants. This is also the best way to maintain your ponds, as it won’t harm your water plants or animals currently living in the pond. Thank you for reading this post about duckweed. 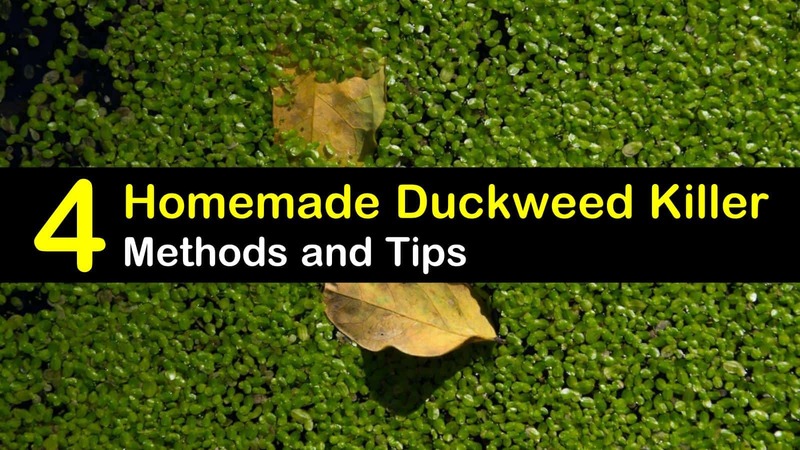 We hope some of these homemade duckweed killer ideas were helpful. 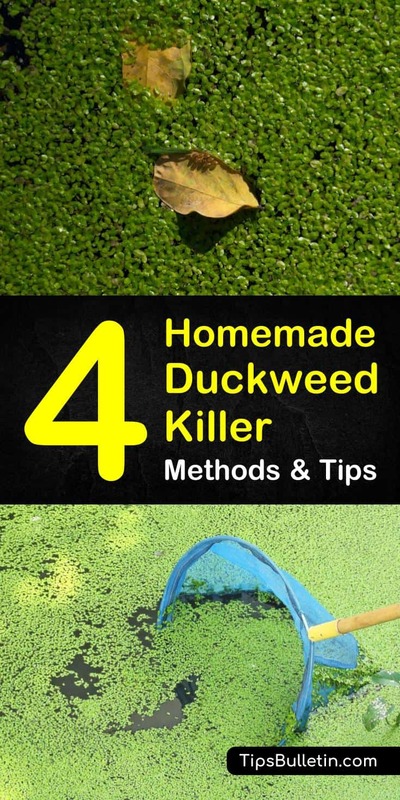 If you found any of our tips on how to get rid of duckweed useful, please take a minute to these weed killer tips on Facebook and Pinterest.